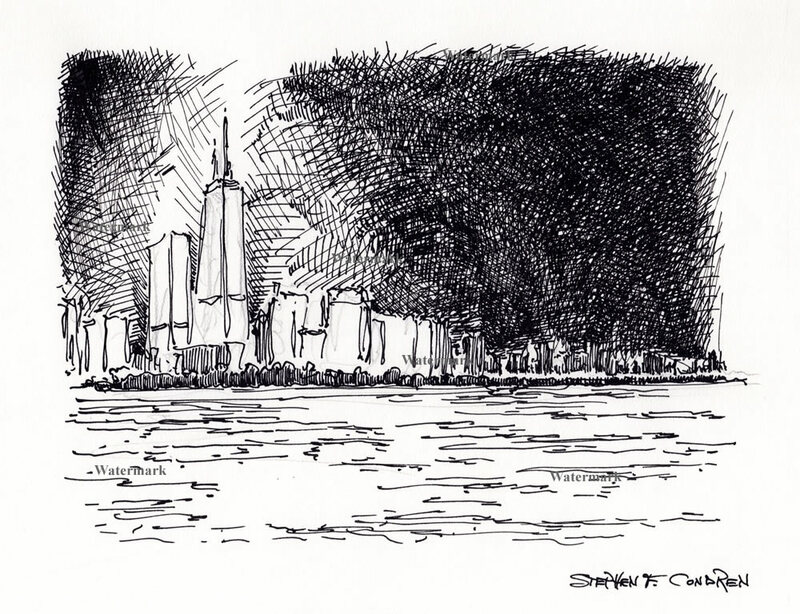 This article is about skyline art and cityscape art are the artistic expression of metropolitans areas and cities the world over, which is for sale at discount with prints by artist Stephen F. Condren, BFA-SAIC, of Condren Galleries, a Fine Arts Gallery, offering JPEG & PDF scans. The skyline of a city is the unique barcode image of that site, and lets you know immediately what city it is. As a native of Chicago, I have grown up with famous towering skyscrapers and learned to love them. My father owned the 10 story Silver Smith Building at 10 South Wabash, in downtown Chicago. The Silversmith Building was designed by Peter J. Weber of D.H. Burnham & Company. 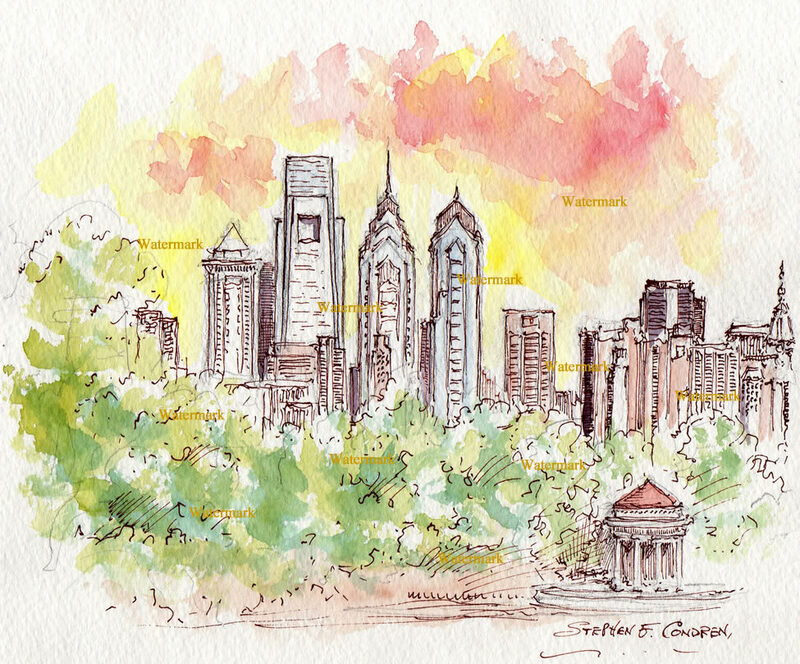 I have made it my focus here at Condren Galleries Ltd., to categorize my skyline art. The categories are divided into four distinct groups; watercolors, pen & inks, drawings, and oils. When I first started out in college I had wanted to be an architect. I was Mr. Pierce’s best student in his drafting class at Naperville Central High School. It was here that is where I aspired to be an architect. However, as time passed I saw my true calling of Art. I pursued studies in Architecture taking the required courses. Structural Detailing, Engineering Graphics, and Architectural Delineation classes at the College of DuPage, in Glenn Ellen, Illinois. It was in Mr. Jorgenson’s class on Architectural Rendering that I did the famous Loeb Mansion, renderings of the Leopold & Loeb murder trial of 1924 with Clarence Darrow. These renderings are now in the collection of the Chicago History Museum. After my studies at the College of DuPage, I took time off to serve in the United States Navy. I was stationed aboard the aircraft carrier, The USS Midway CV-41. While on board I was appointed as the ship’s artist and did all of the artwork for the ship Cruise Book. This gave me the opportunity to draw the portaits of the Admiral, Captain, many other officer’s and crew in their respective trades on board the ship. All of the artwork that I did for the cruise book was done in pen & ink. Unfortunately, due to the printing process and publication I was told that the original works of art when submitted would not be returned to me. I knew that I would never see these works of art again, but I am pleased that they could be used for the publication which is eternal. Upon my honorable discharge from the Navy I got married and then matriculated to the School of the Art Institute of Chicago. While at the Art Institute I majored in Drawing and Painting and I never looked back. I learned a tremendous amount at the Art Institute and I always look back on the wonderful year. While I was there, I had the blessing to attend with my aunt Marie Schoonhoven (my mother’s sister). Aunt Marie was an artist the focused on prints and etchings. At the Art Institute I bloomed as an artist. Within a few years I was asked to join the faculty of the College of Lake County to teach Architectural Rendering and Engineering Graphics. In later years I became certified public High School Teacher. This time really honed my skills as an expert teacher and architectural draftsman & illustrator. In those year I did many projects for Architects and Engineers. The impact of all these thing further enhanced my drafting skills. I have now combined my drafting skills with my Fine Art. The impact of the this union of skills are wonderful architectural skylines. 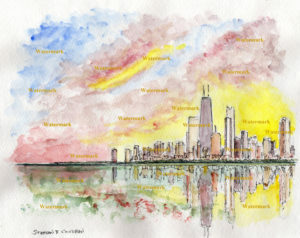 Watercolor of Chicago skyline at sunset. Watercolors have always been a favorite medium of mine in any subject area, and skyline have truly work here for me. The wonderful thing about watercolor is that they are translucent. 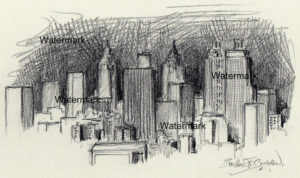 Thus, you can work with pen & ink or pencil in conjunction with the watercolor to give linear qualities to the skylines. The watercolors give a whole new dimension to the work of skyline art. 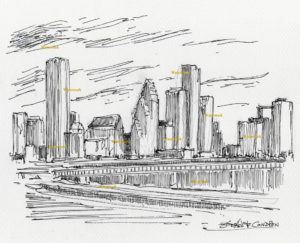 Pen & ink drawing of Houston skyline. Pen & inks are my favorite mode of artistic expression, when I hold a pen in my hand I feel like a poet. The wonderful thing about pen & ink is that it is immediate and the impact of the image that you make with them is strong. The pen & inks make excellent reproductions with their bold linework. I make use of hatching and cross-hatching to work the various degrees of shade and shadows. The high contrast nature of pen & inks lend themselves to a strength of line that cannot be matched by pencil. Charcoal can match the degree of darkness but never the fine lines. This strong line work is ideal when drawing architectural images for they bring out the fine ornamental details and contour lines. Atlanta skyline pencil drawing of downtown at night. Drawings are the very core of my life. When I touch the paper with my pencil I am instantaneously in one spirit with it, an almost existential experience. The unique thing about pencil drawing is that they make use of a long series of shades. You can draw a building and then play with the gradual diminishing of the lead to make the light move into darkness. Atlanta Skyline Oils At Night. Oils are the most difficult medium to work with when it comes to painting skylines for you cannot really delineate as you can with pen & inks and pencil. I treat oils as though they were pencils in a sense and work with the gradual transition of colors and tones, not delineation. When it comes to skylines it is difficult to surpass Manhattan and Chicago. Many of my skyline have been use for closing gifts by Realtors and for presentations to Architects and Banks for new construction. 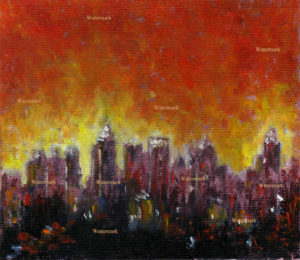 Coupled with skylines are house portaits which are a popular housewarming gift.